Viral challenges usually make you think of people doing stupid things yet sometimes they can create something truly awesome. Following in the footsteps of the ALS Ice Bucket Challenge, the latest viral trend of the Trashtag Challenge is seeing people make a positive impact on the world around them. Like all great movements the idea behind it is very simple: share ‘before’ and ‘after’ pictures of an area of land that were once filled with litter and trash, and encourage others to do the same. Not only does the Trashtag challenge encourage people to do some good in the world, it will hopefully encourage those who think it’s fine to just drop litter or leave a pile of rubbish at the beach to change their ways. Non-profit organisation SCUBA – whose mission is to protect ocean wildlife – has got involved with the challenge, taking the clean-up mission to the ocean. Formed by Harrie Kerley, 32, from Durrington, who has worked in fundraising for the marine conservation for the last 11 years and friend and cameraman Duncan Kenning, 34, from Matlock, SCUBA shared a video last night (March 12) of one of the beaches they cleaned during a two and a half-month trip in Vietnam. 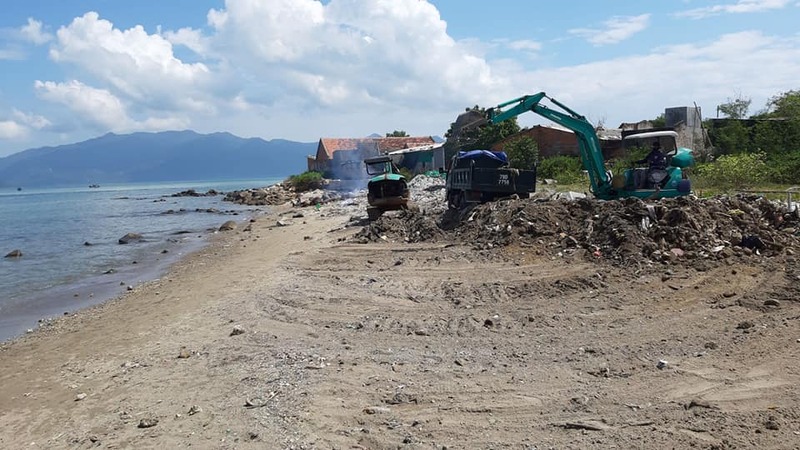 Intended as the launch video of their #picuptrip from Ho Chi Minh City to Hanoi, the images of their incredible Vình Luong Beach makeover has gone viral, attracting 231K views at time of writing (March 13). This was of course more than a two-man job and incredibly – despite the three-month time lapse – it was only a 10-day job after hundreds of local volunteers and travellers pitched in to help. Vình Luong Beach was discovered by accident on December 18 when we were traveling by motorbike across Vietnam on SCUBA’s #picuptrip. We then spent 2.5 days cleaning as much of the beach as possible with 12 local volunteers, help from the government and local schools. In the end we filled up 301 bags = 1,505kg. With more beaches to clean the pair continued up the coast, but didn’t feel they finished the job as well as they could. They decided to come back more organised and with more people to shift the load. Two months later they returned and cleaned for seven days straight with the assistance of local school kids, other organisations and the tools to do the job properly. We involved the army, the local and regional government, we spoke in schools to 1,700 children and invited lots of local and international volunteers. We estimate to have had over 300 people join us throughout the week! 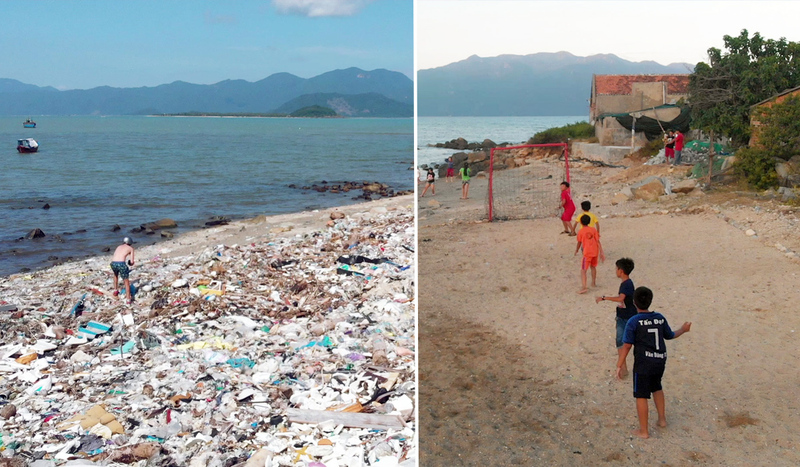 We hired excavators and bought tools and equipment and in seven days we cleaned the main beach at Vình Luong and turned it into a football pitch for the local children. We also cleaned the main beach in the town harbour and installed a educational painting on the wall that overlooks the village to remind people to protect their ocean. 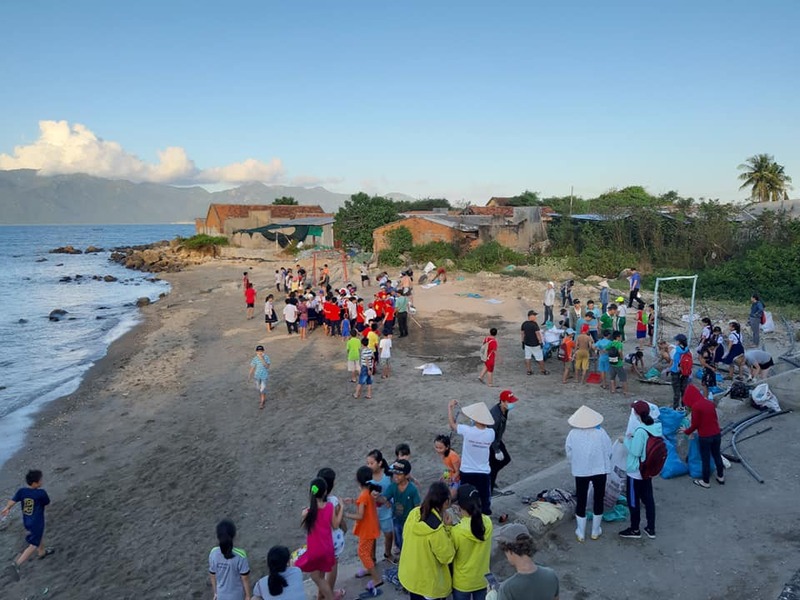 Over the course of the trip from south to north Vietnam, Harrie said they hosted 15 cleans including ‘beaches, reefs, cities, forests, parks and tourist hot spots’ removing over 150,000kg of plastic pollution and mobilising over 600 volunteers along the way. He told UNILAD, the trip wasn’t ‘to highlight the negative aspects but to document the amazing organisations making a difference out here and to be a part of this inspiring change’. And added an estimated 80 per cent of volunteers were Vietnamese with international travellers and expats pitching in. It’s absolutely incredible! When we left for the #picuptrip I was literally testing the water about whether SCUBA would have legs in Vietnam… and it certainly does. There are so many passionate people in Vietnam who want to do good and protect the ocean; they just need the right platform for that door to open and start it. I know that cleaning beaches should be the last thing we do to protect the ocean (as we should be tackling the issue at source with businesses and governments) but cleans show that people are willing to take action. People do want change. Our mandate on this trip was to simply stop the plastic and waste from reaching the ocean and inspire others to clean with our actions. I really hope that our videos and images will continue to inspire people around the world to think differently about their relationship with single-use plastic and how people treat the planet. At SCUBA first and foremost we believe in ‘Ocean Education for all’ and our aim is to inspire more people to fall in love with the ocean and help protect it. Now that’s a viral trend we should all get behind. You can find out more about SCUBA’s work on their Facebook page and donate to their cause on JustGiving. Can You Ace This Surprisingly Difficult "Elf" Quiz? Which Character From AMC's "The Terror" Are You?